From design to deployment, our approach transforms difficult tasks into real-world software that improve your productivity. Custom Software Lab is a professional custom software development firm that has been designing and supporting highly customized business process workflow automation systems for over fifteen years. From design to deployment, Custom Software Lab’s approach transforms difficult tasks and processes into real-world solutions that improves productivity and increases business efficiency. We have vast expertise in building custom business software of various level of complexity for a wide range of industries. 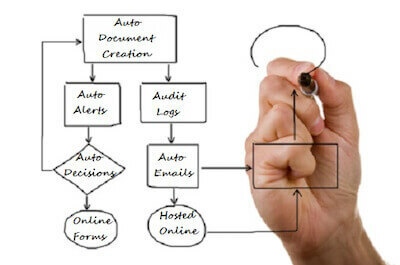 Our dedicated teams have a proven track record of delivering business process automation solutions for Financial, Healthcare, Manufacturing, Retail, Transportation, Technology, Travel other business domains allows us to provide our clients with custom solutions that make it easier to run their businesses. By controlling the way work gets done, you can begin to measure how effective is your business operation strategy. Our experienced team will take the time needed to understand and analyze your current business operations and process workflow in order to deliver a solution that optimizes your efficiency and returns a solid ROI.